Well here’s something I never imagined I’d be doing: Holding a lecture – twice, actually, plus a real-time restaurant field trip – on the art and science of restaurant reviewing. You can join me this fall at the Princeton Adult School for a no-holds-barred evening or two. Last week I spoke on this subject to members of the Princeton Regional Chamber of Commerce – and had a ball. In the audience was Rich Rein of US 1 newspaper and Community News Service, who was my editor and my patron for many years. Here in the February 21st issue of US 1, he provides a very nice, thoughtful recap of my talk, for which I am very grateful. At long last, farmers market season is underway! With it comes changes. Here, in the May 2017 issue of the Princeton Echo, I introduce you to Kate Festa, the 27-year-old dynamo now managing the Princeton Farmers Market. Also included: a line-up of new vendors at this and other Central NJ markets this spring. If you’re not already familiar with the other KFC – Korean Fried Chicken – you may want to avail yourself stat. The well-known purveyor, Bon Chon, has been active in New Brunswick for a while. Thankfully, the wonder that is Korean fried chicken has finally debuted in Princeton, at the independently-owned Hobin Chicken. Details on this, and on Kevin Carroll’s ‘Compost Man’ quest to turn the household waste of Mercer and Hunterdon counties into rich compost, here in my FFT column in the May 2017 issue of the Princeton Echo. In U.S. 1‘s spring dining issue I get the stories of three women who have ventured out on their own to start bakery-cafes – with great success: Jen Carson of Lillipies, Joanne Canady-Brown of the Gingered Peach, and Marilyn Besner of WildFlour. New Jersey Monthly‘s April issue spotlights, among other things, 34 scenic treks throughout the Garden State. I was pleased to contribute 3 of my own favorites: the vista atop Baldpate Mountain (the highest spot in Mercer County), the quirky Pole Farm at Mercer Meadows, and a portion of the sprawling Sourland Mountain Preserve that’s as atmospheric as it is sparsely trekked. The one-day conference brought together scholars and experts from universities, the food industry, government policy organizations, and others to discuss sustainability. I recap the proceedings in the April issue of the Princeton Echo, including key takeaways from NJ food professionals in attendance. But first, a sad farewell to a pioneer of our state’s fine dining scene. In the early 1980s, Jim Filip’s Jersey Shore restaurant, Doris & Ed’s, helped us overcome our status as a fine dining backwater. He passed away on March 7th at the age of 75. Doris & Ed’s was the first in the Garden State to receive a James Beard Award – and that was just one of many accolades. The Highlands restaurant was renowned for its seafood and its perch on Sandy Hook Bay that afforded a spectacular view of the New York Skyline. The restaurant closed permanently after suffering damage from hurricanes Irene and Sandy. The West Windsor native’s widely acclaimed Tasting Rome: Fresh Flavors and Forgotten Recipes from an Ancient City, a lively guide to the vibrant Rome dining scene (with recipes), took home top honors in the travel category earlier this month at the conference of the International Association of Cooking Professionals (IACP). The award went to Parla and the book’s photographer, Kristina Gill. 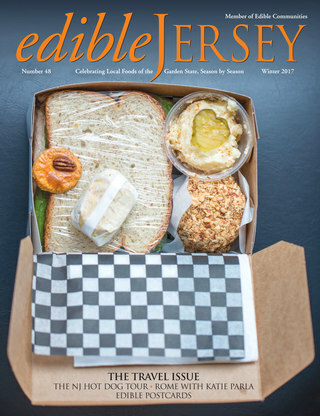 I wrote about Katie Parla’s Jersey roots in my profile here in the Winter 2017 issue of Edible Jersey. Speaking of Edible Jersey, here in the Spring 2017 issue is my profile of Pam Flory. (Clearly, that’s not her on the cover). She’s the energetic powerhouse who has broken new ground – literally and figuratively – in making her school’s garden a national model. Thanks to the insistent prodding of a good friend, over the last few months I’ve enjoyed meals at these history-laden eateries that are long on both charm and first-rate fare. If you’re not familiar with them, I urge you to check them out. Lumberville General Store: It’s across the street from the Black Bass Inn, has the same owner, and, like the Inn, is in a historic stone structure (1770) that radiates charm. But that’s about all the two have in common. In keeping with its original roots, this cafe/deli/bakery maintains casualness and warmth, and its seemingly casual menu belies the kitchen’s care and expertise. At breakfast, for example, the sausage is housemade, the salmon smoked on premises, and the hash browns undergo sous vide in a multi-step process that results in the best I’ve encountered. Here are pics of our breakfast choices, each a mere $7.95. Lumberville Cafe breakfast sausage with two fried eggs on a buttermilk scallion biscuit with hash browns. Inn at Barley Sheaf Farm: The house and grounds of this beautifully preserved farm were once owned by playwright George S. Kaufman, and is primarily a bed & breakfast. But its stunning dining rooms are open to the public and I particularly recommend the classic brunch served in the glass-encased conservatory on weekends. The setting and the service could not be more gracious, and a three-course $35 prix fixe meal includes a complimentary mimosa, fabulous bread and muffin basket, and coffee or tea. 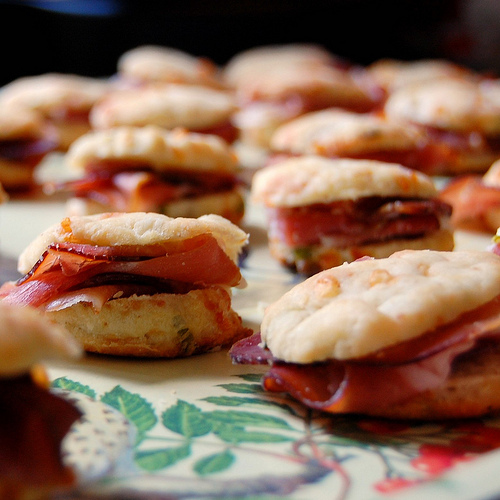 The menu boasts an array of choices – some traditional, some modern – for starter, entree, and dessert. Our happy picks included maple-glazed pork belly with grits and a poached egg and avocado and oven-roasted tomato toast with an egg (sunny side up), ricotta, and baby field greens. Talk about a mixed bag! Today’s post runs the gamut from coq au vin and crispy pork riblets to authentic ramen and hard-to-come-by Italian-style breast of veal. Oh yes: and how you can experience collecting nectar like a bee. The folks who raise Griggstown’s chickens and other premium, all-natural birds have launched a YouTube channel that has New Jersey’s top chefs demonstrating how to put those birds to excellent use, and pairs each video with related special offers. I sat in on the first taping and got the behind-the-scenes scoop while Albrecht demonstrated making coq au vin. My full report here, in the March issue of The Princeton Echo. The folks behind Princeton’s popular Elements and Mistral restaurants – Steve Distler & Scott Anderson – opened their second Mistral on March 1st, across the river in Pennsylvania. As I reported a few months back, chef de cuisine for this newly constructed space is Craig Polignano, who left the Ryland Inn (and moved to Conshohoken) to take the post. The bright and airy restaurant is larger than its older sibling – 111 seats inside and 48 outside – but just as stylish, although with a different aesthetic, dominated by pale, whitewashed wood tones accented with bright azure. Below are highlights from my first meal there. Three of us shared seven dishes, each so impressive that it was hard to pick favorites. The menu structure is mostly small plates (like its Princeton forebear), but the selections are unique to KOP. If you go: locating the restaurant is tricky. It’s next to Nieman Marcus. Look for the sign for Grand Lux Cafe – Mistral is below. Think you know all about how bees gather nectar? I guarantee you’ll be gobsmacked by what you didn’t know at this small but captivating display in Ewing at The College of New Jersey. Please accept this post in the spirit it is offered: as a short respite from the craziness going on all around us. By now you’ve probably heard of Katie Parla, author of the acclaimed book, Tasting Rome, and whom Mario Batali considers “an expert on all things Rome.” Parla talks about her Jersey roots and future plans in my story in the Winter 2017 issue of Edible Jersey, here. All the Main Street properties – this bakery/cafe, the bistro in the Princeton Shopping Center, the commissary in Rocky Hill – were bought out late in 2015 by the folks behind Agricola in Princeton. But since then, this modest bakery/cafe that had anchored the tiny hamlet of Kingston since 1984 changed hands again. In March, it will reopen – newly refurbished and expanded – as a PJ’s Pancake House, the third (but not last) iteration of the iconic Nassau Street eatery. Get the scoop on this and the growing stable of eateries from the Gretalia Hospitality Group via my feature story here, in the February issue of the Princeton Echo. Downtown Trenton finally gets a great breakfast spot (and lunch, too). Hot beignets and coffee with chicory are just two of the New Orleans-style offerings from chef/owner Bert Dumas of Studio B Bakery & Bistro across from the Sun Center. Just in time for Valentine’s Day: 2 romantic restaurant tales from the staffs at Princeton area restaurants. A passel of new and forthcoming restaurants in and around Central NJ.